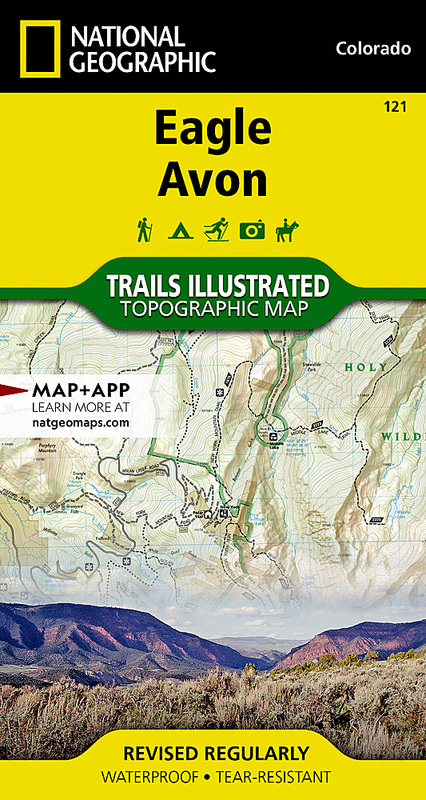 National Geographic's Trails Illustrated map of Eagle and Avon is the ultimate tool for exploring this region in the heart of the Colorado Rockies. Designed for experienced and novice outdoor enthusiasts alike, this expertly researched map was created in partnership with the U.S. Forest Service, Bureau of Land Management and others and delivers unparalleled detail of the area. Coverage includes Holy Cross Wilderness, White River National Forest, Beaver Creek Ski Area, Bocco and Hardscrabble Mountains, Eagle River, Gypsum Ponds State Wildlife Area and Sylvan Lake State Park. Explore the area by following along clearly mapped trails, marked for hiking or motorized use. Road and mountain bike trails are clearly labeled, as are winter trails. Some other recreation features are alpine and cross-country ski areas, campgrounds, 10th Mountain Division trails and huts, fishing holes, boat launch points and wildlife viewing areas. To aid in your navigation, the map includes contour lines, elevations, labeled peaks, summits and passes, water features, numbered Forest Service and BLM roads, areas of wooded cover, selected waypoints and clear boundaries between different land management agencies. Also provided are wilderness regulations, survival tips, Leave no Trace guidelines and essential contact information. Other features found on this map include: Hardscrabble Mountain, Holy Cross Wilderness, White River National Forest.